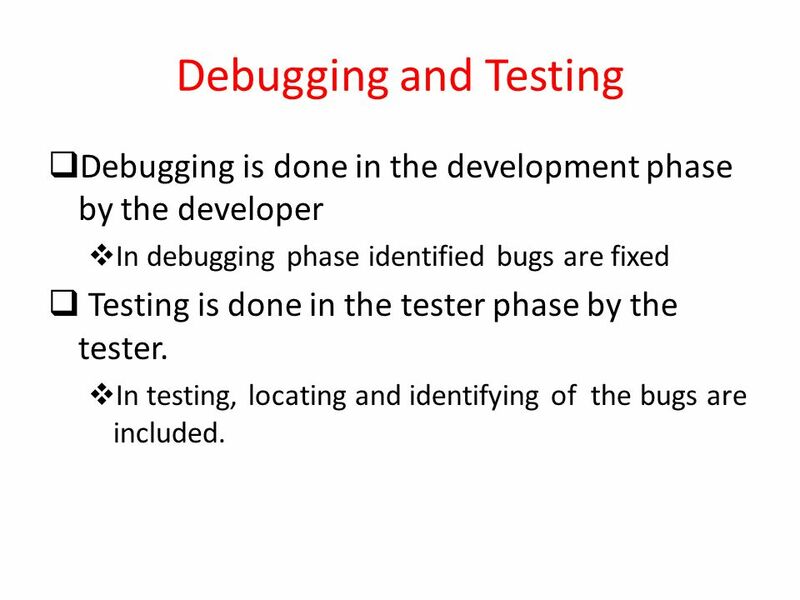 6 Debugging and Testing Debugging is done in the development phase by the developer In debugging phase identified bugs are fixed Testing is done in the tester phase by the tester. In testing, locating and identifying of the bugs are included. 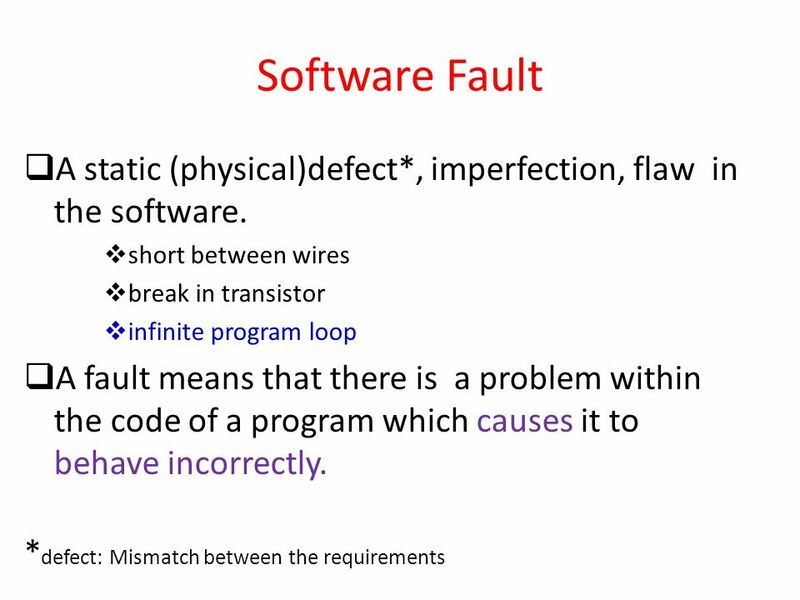 9 Software Error Error is an incorrect internal state that is the demonstration of some fault. 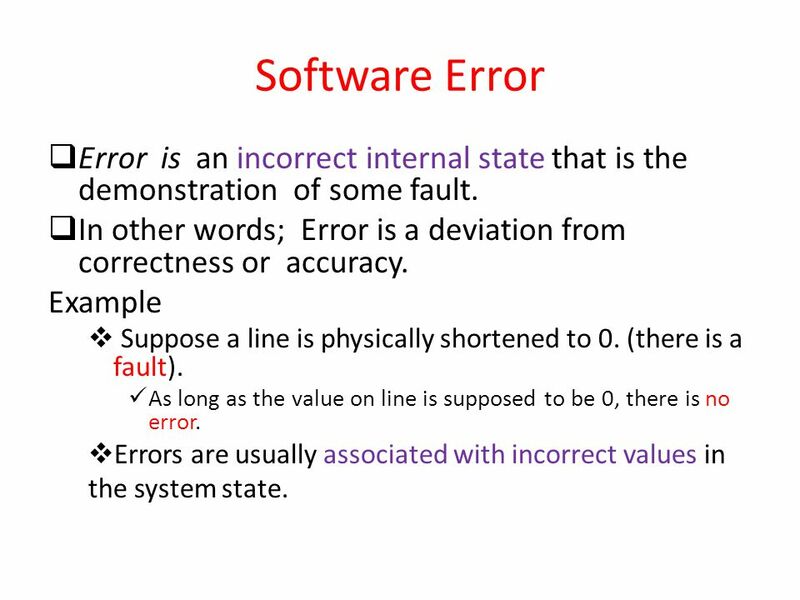 In other words; Error is a deviation from correctness or accuracy. 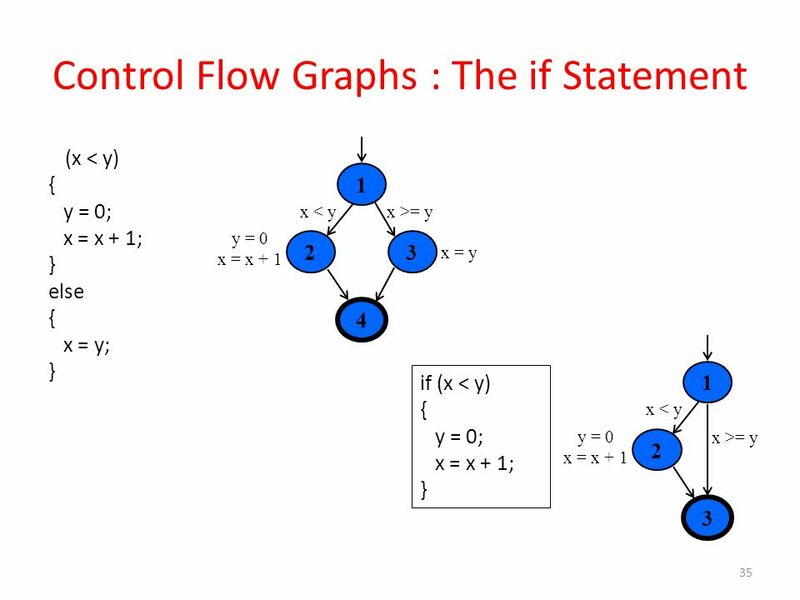 Example Suppose a line is physically shortened to 0. (there is a fault). As long as the value on line is supposed to be 0, there is no error. 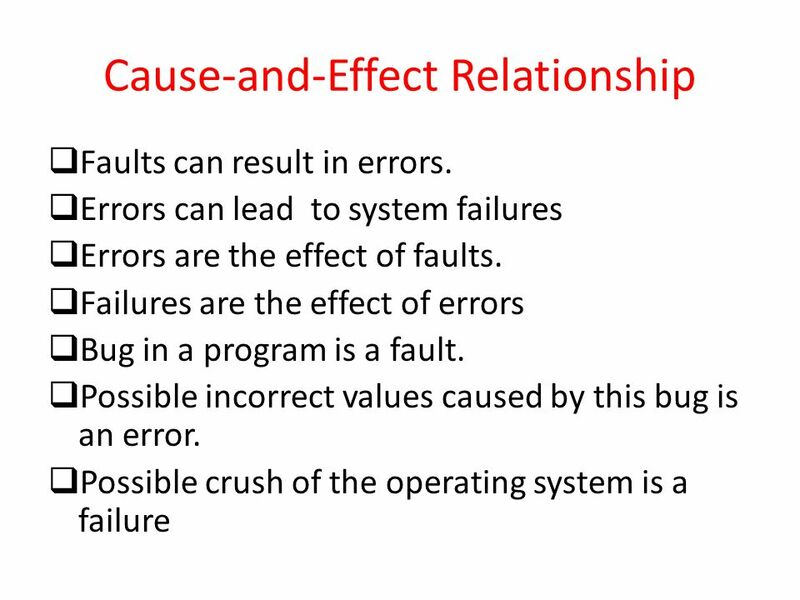 Errors are usually associated with incorrect values in the system state. 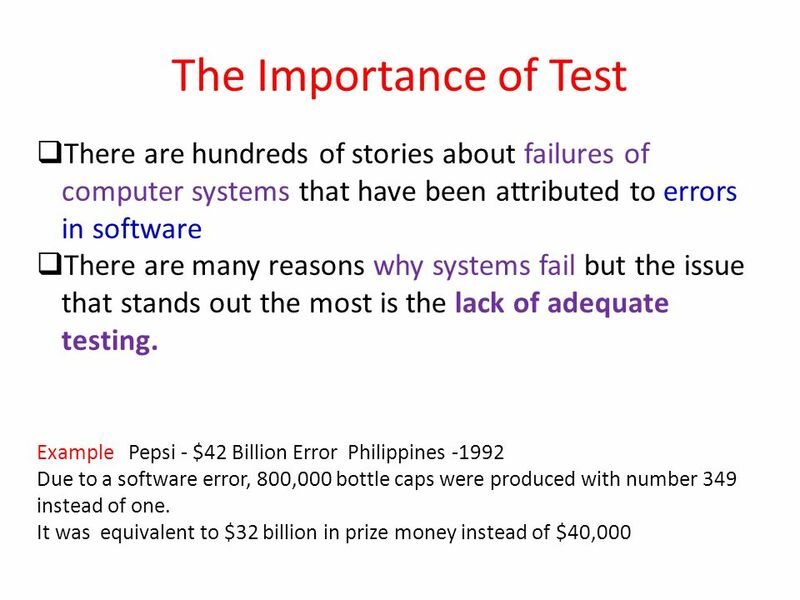 10 Software Failure A failure means that the program has not performed as expected, and the actual performance has not met the minimum standards for success. 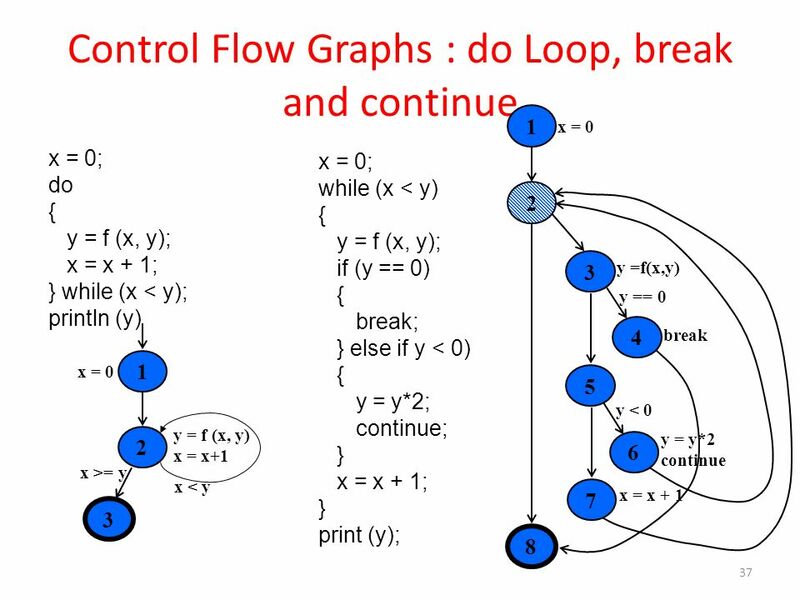 External, incorrect behavior with respect to the requirements or other description of the expected behavior Example Suppose a circuit controls a lamp (0 = turn off, 1 = turn on) and the output is physically shortened to 0 (there is a fault). 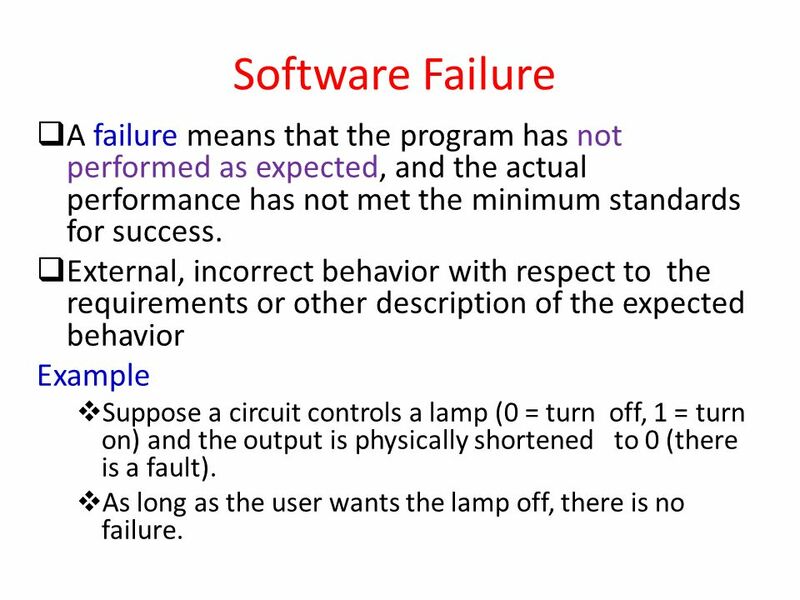 As long as the user wants the lamp off, there is no failure. Consider a medical doctor making a diagnosis for a patient. The patient enters the doctor’s office with a list of failures (that is, symptoms). The doctor then must discover the fault, or root cause of the symptom. To aid in the diagnosis, a doctor may order tests that look for anomalous internal conditions. 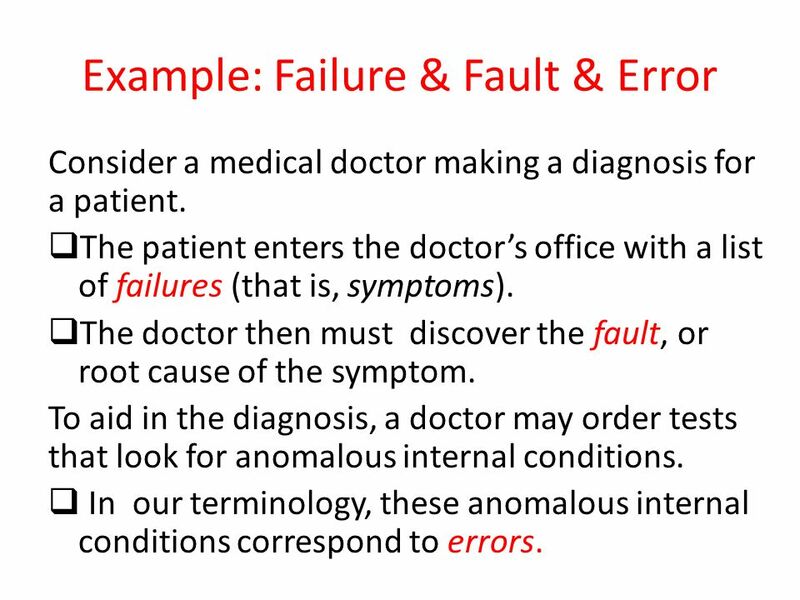 In our terminology, these anomalous internal conditions correspond to errors. 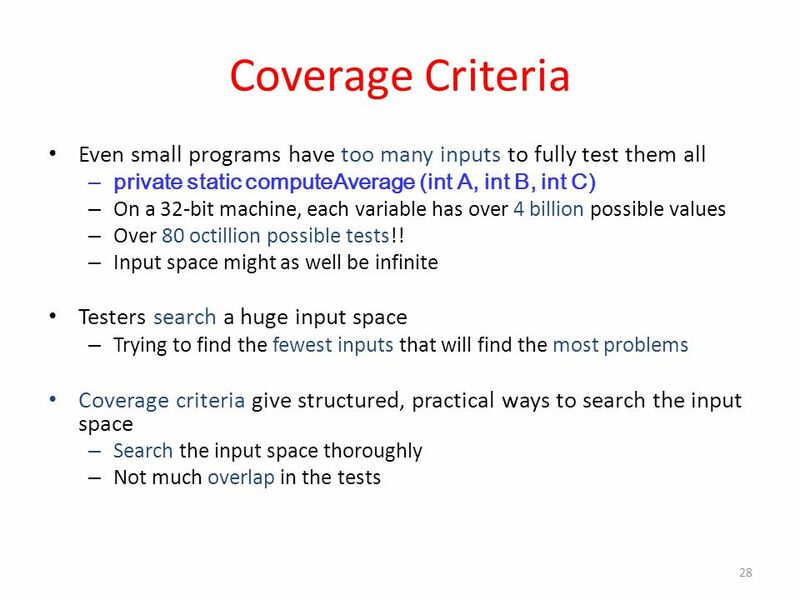 The fault is that the program starts looking for zeroes at index 1 instead of index 0 For example, numZero ([2, 7, 0]) correctly results with 1, while numZero ([0, 7, 2]) incorrectly results with 0. In both of these cases the fault is executed. 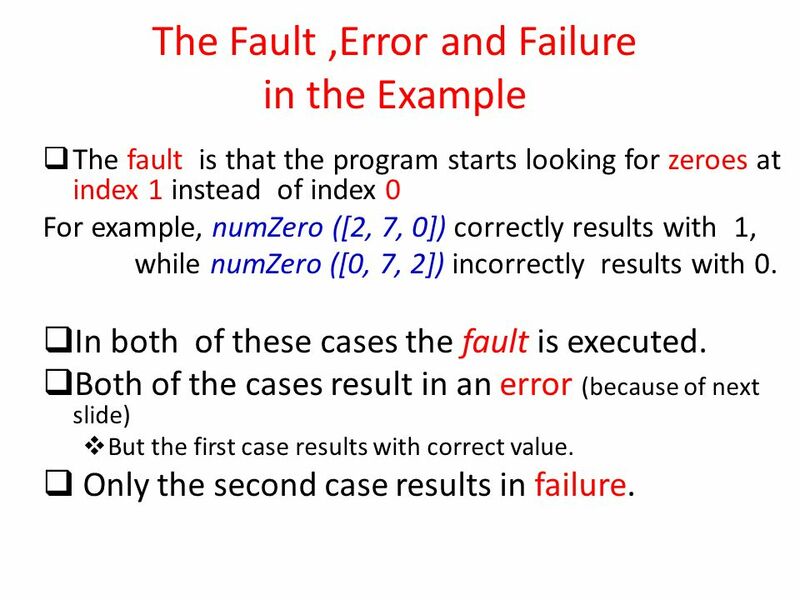 Both of the cases result in an error (because of next slide) But the first case results with correct value. Only the second case results in failure. 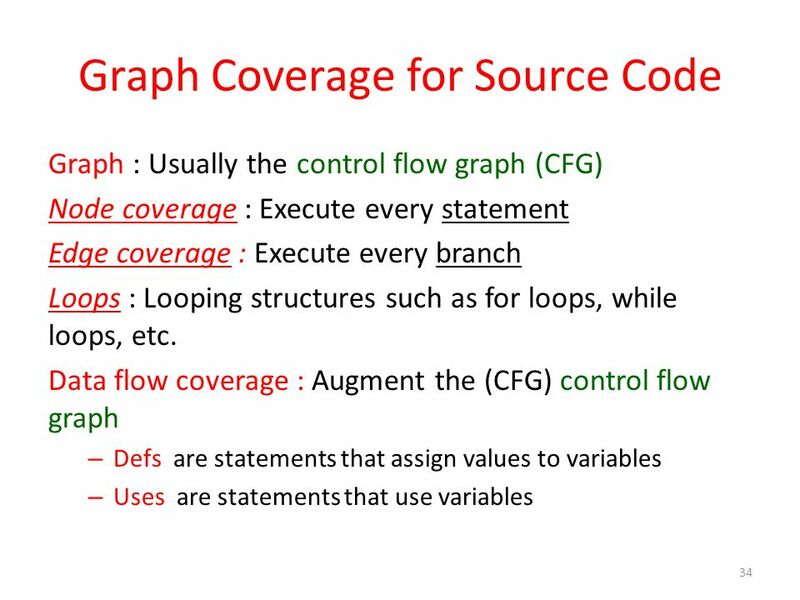 To understand the error states, we need to identify the state for the program. 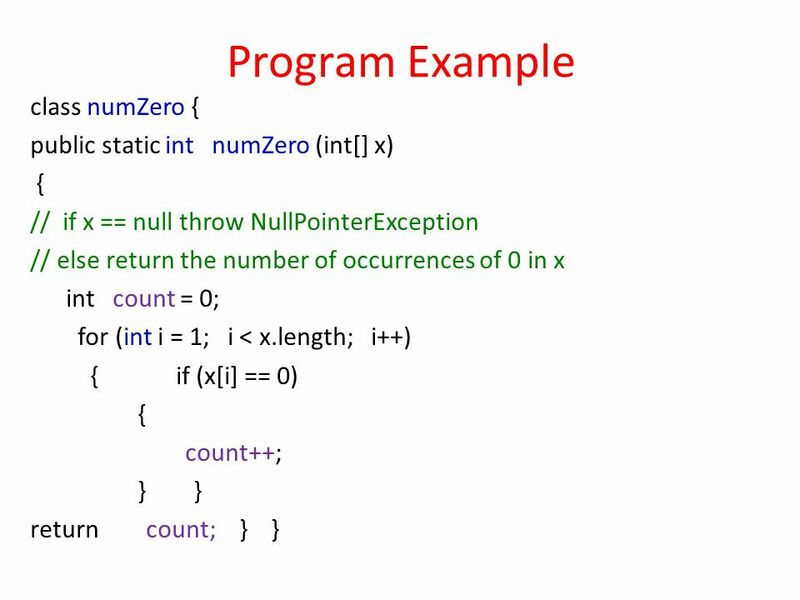 The state for numZero consists of values for the variables x, count , i , program counter (PC). 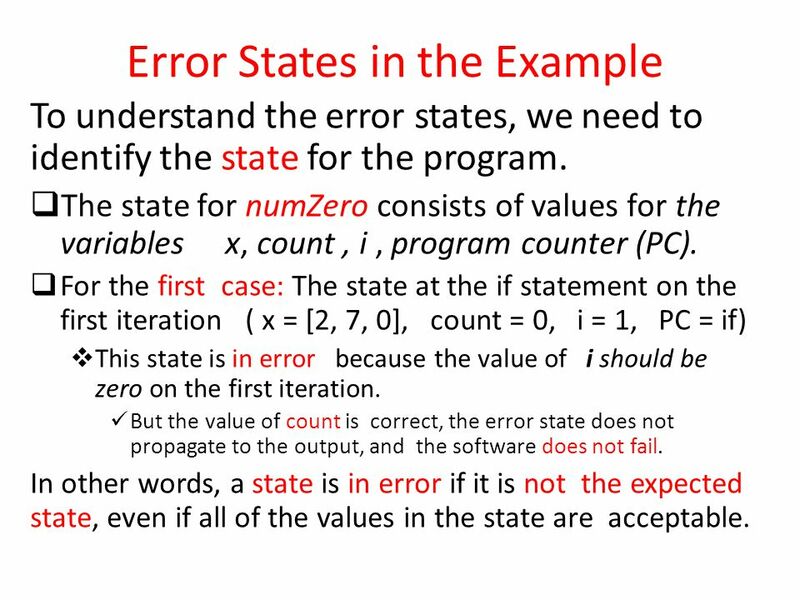 For the first case: The state at the if statement on the first iteration ( x = [2, 7, 0], count = 0, i = 1, PC = if) This state is in error because the value of i should be zero on the first iteration. 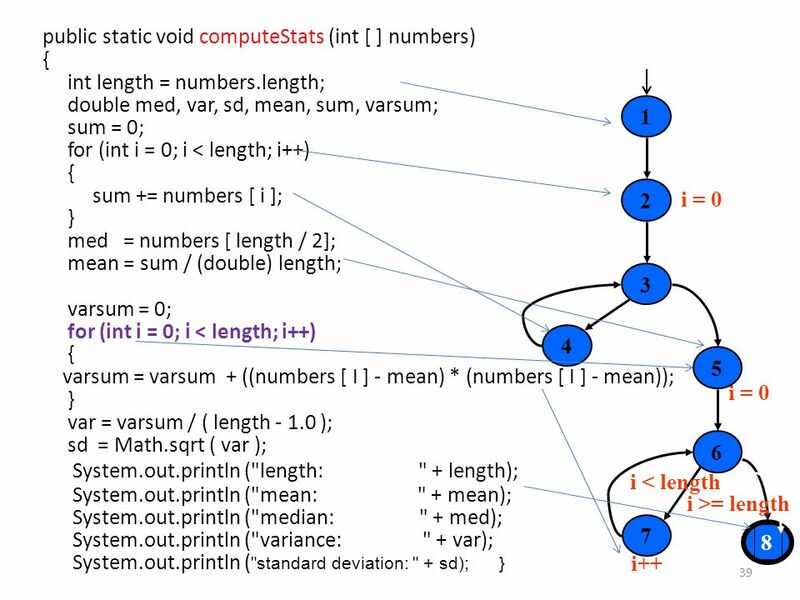 But the value of count is correct, the error state does not propagate to the output, and the software does not fail. 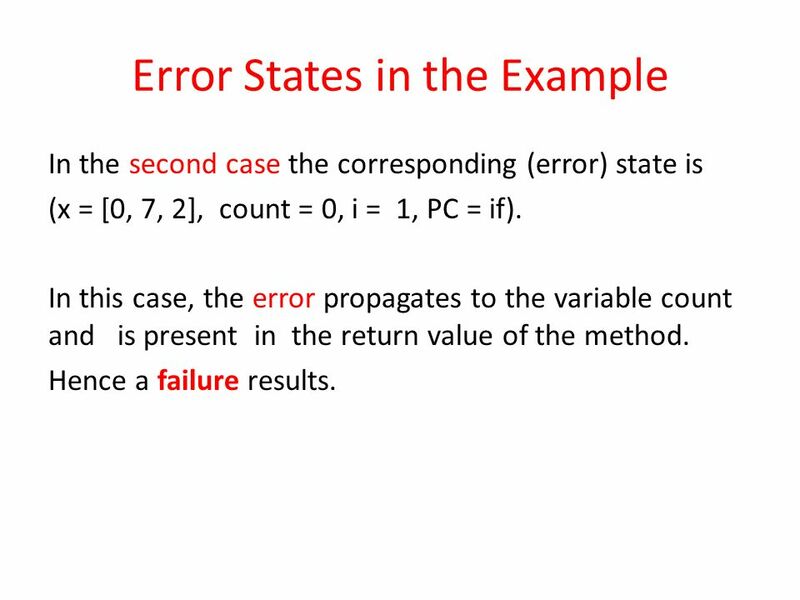 In other words, a state is in error if it is not the expected state, even if all of the values in the state are acceptable. 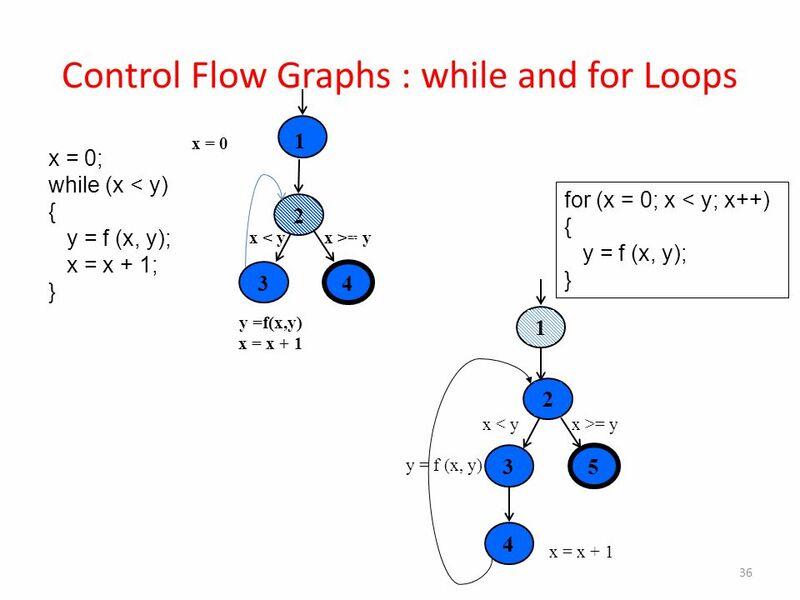 In the second case the corresponding (error) state is (x = [0, 7, 2], count = 0, i = 1, PC = if). 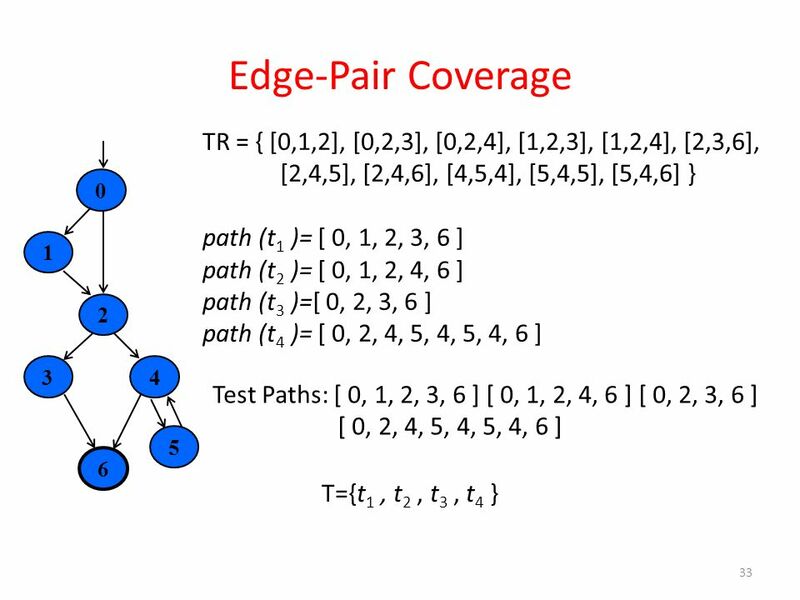 In this case, the error propagates to the variable count and is present in the return value of the method. Hence a failure results. 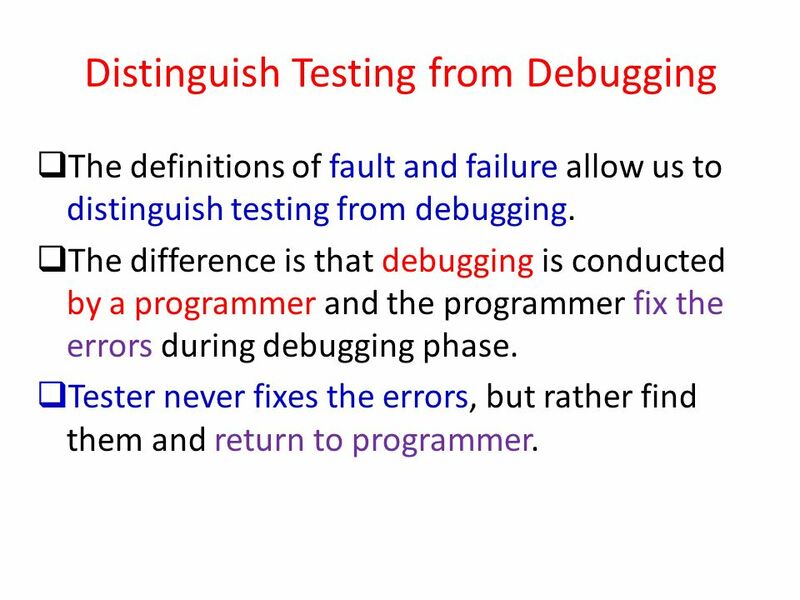 The definitions of fault and failure allow us to distinguish testing from debugging. 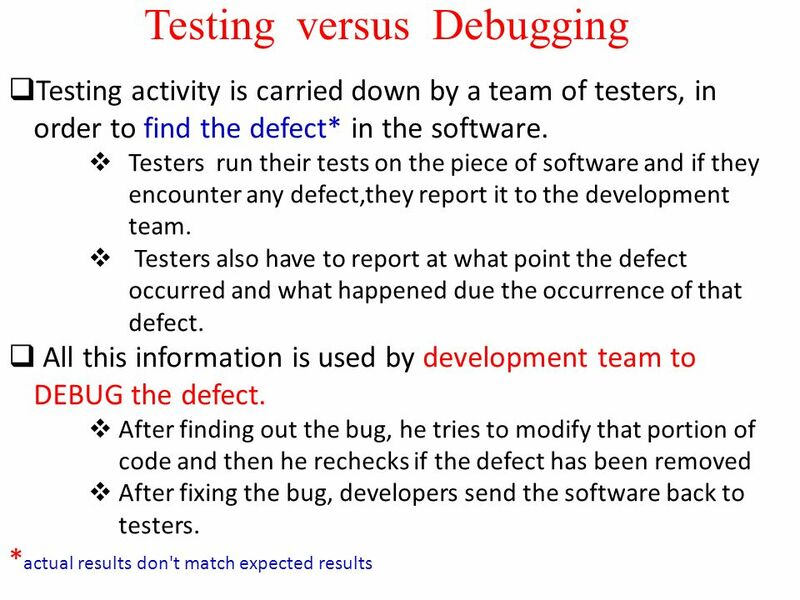 The difference is that debugging is conducted by a programmer and the programmer fix the errors during debugging phase. 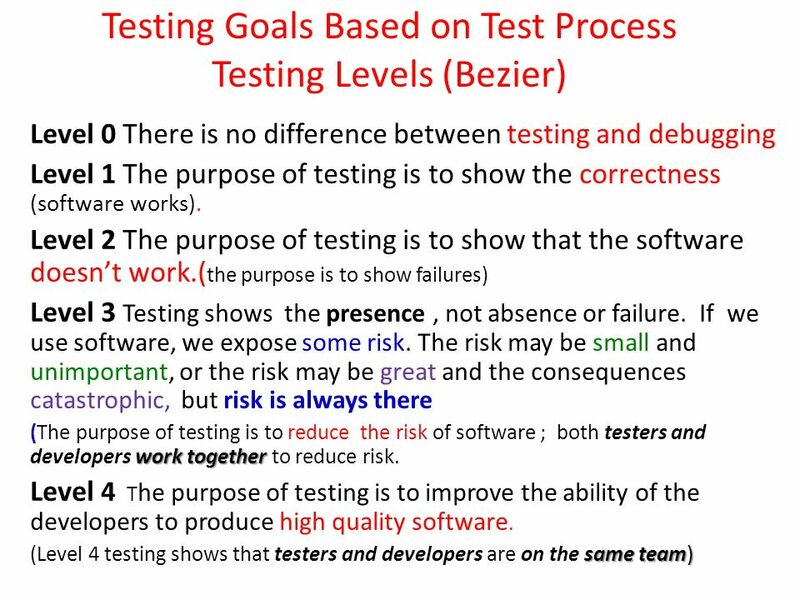 Tester never fixes the errors, but rather find them and return to programmer. 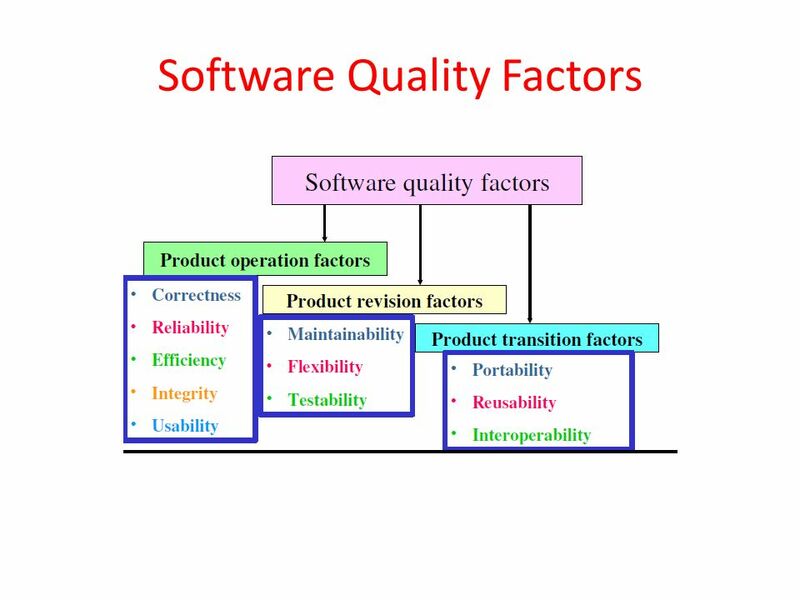 19 What is Software Quality ? 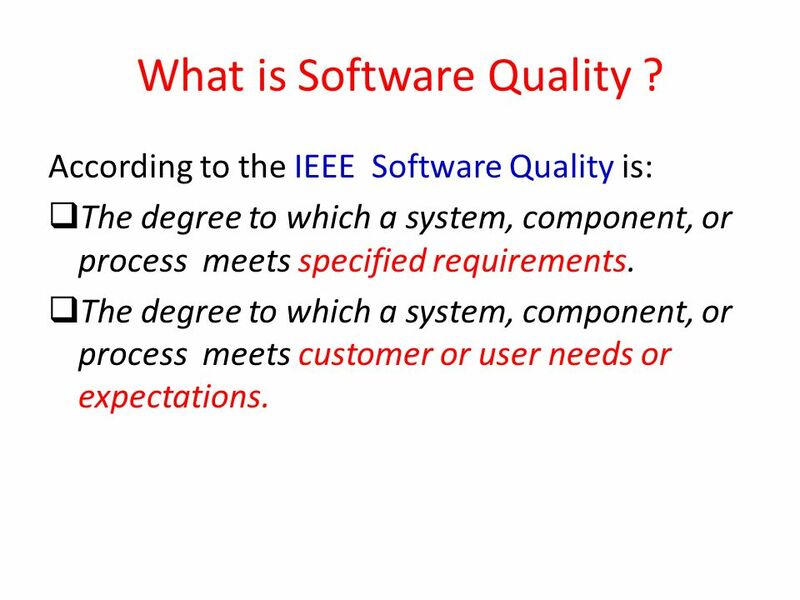 According to the IEEE Software Quality is: The degree to which a system, component, or process meets specified requirements. 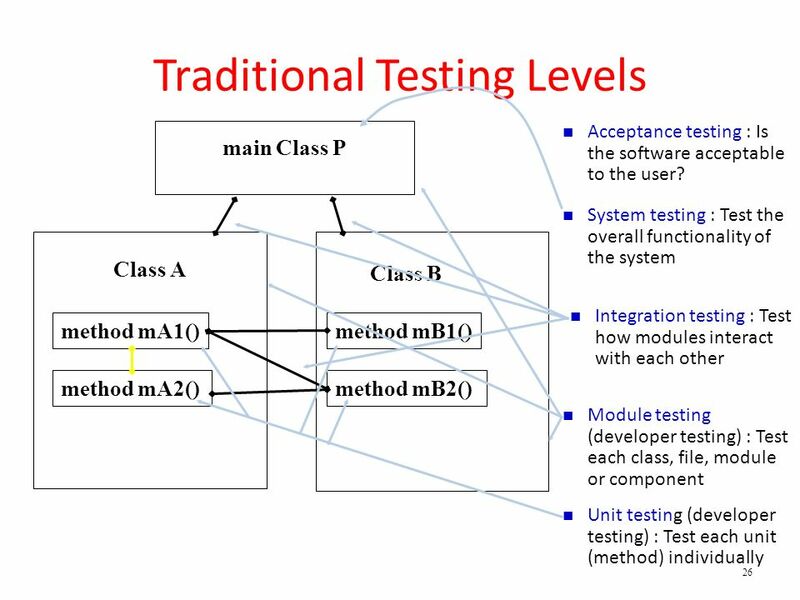 The degree to which a system, component, or process meets customer or user needs or expectations. 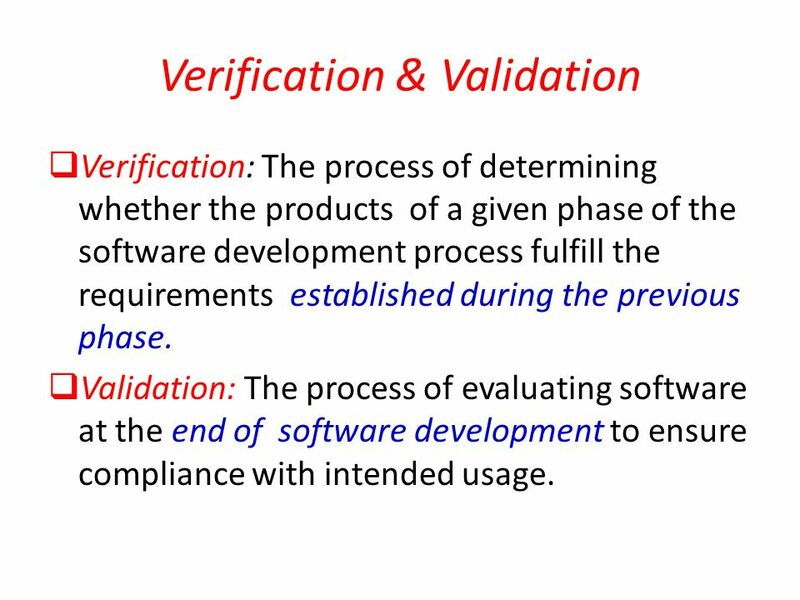 Verification: The process of determining whether the products of a given phase of the software development process fulfill the requirements established during the previous phase. 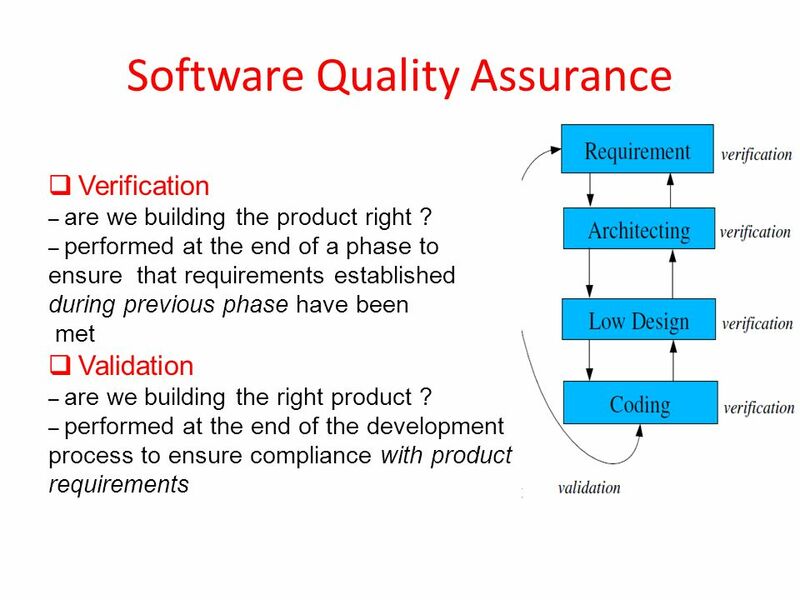 Validation: The process of evaluating software at the end of software development to ensure compliance with intended usage. 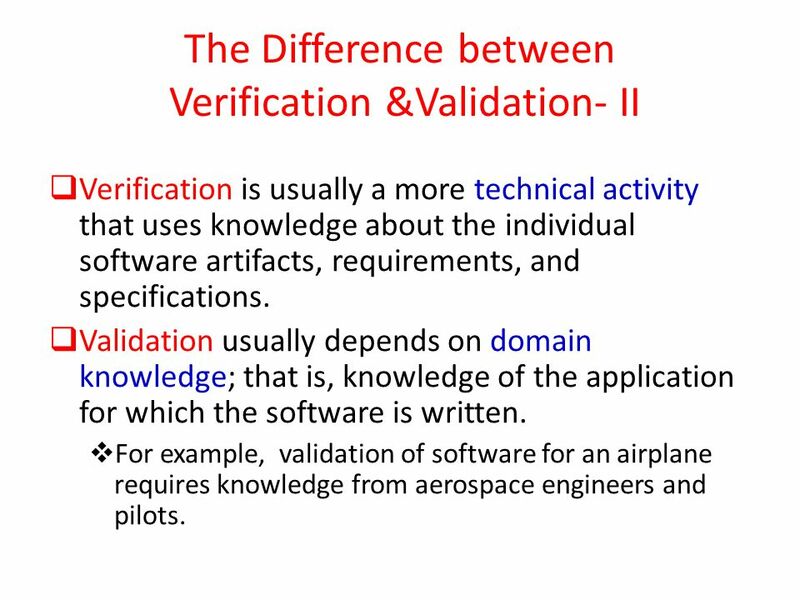 Verification is usually a more technical activity that uses knowledge about the individual software artifacts, requirements, and specifications. 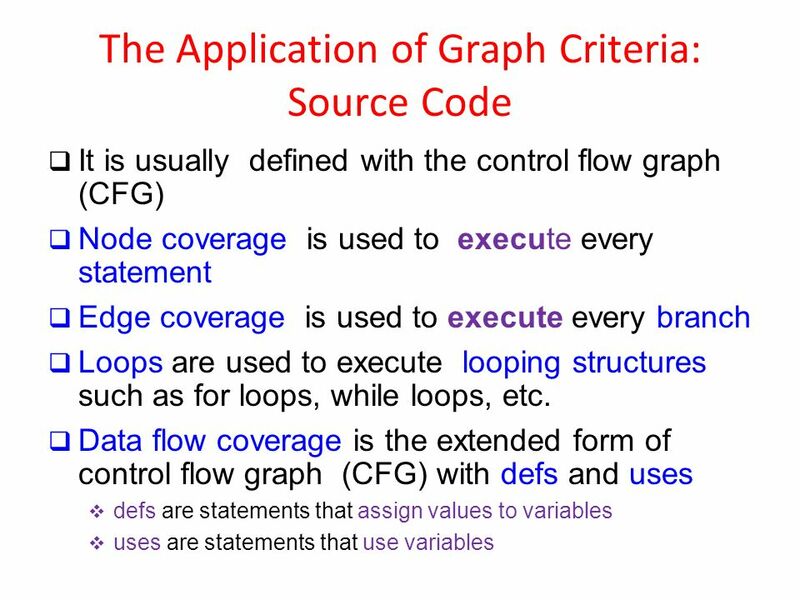 Validation usually depends on domain knowledge; that is, knowledge of the application for which the software is written. 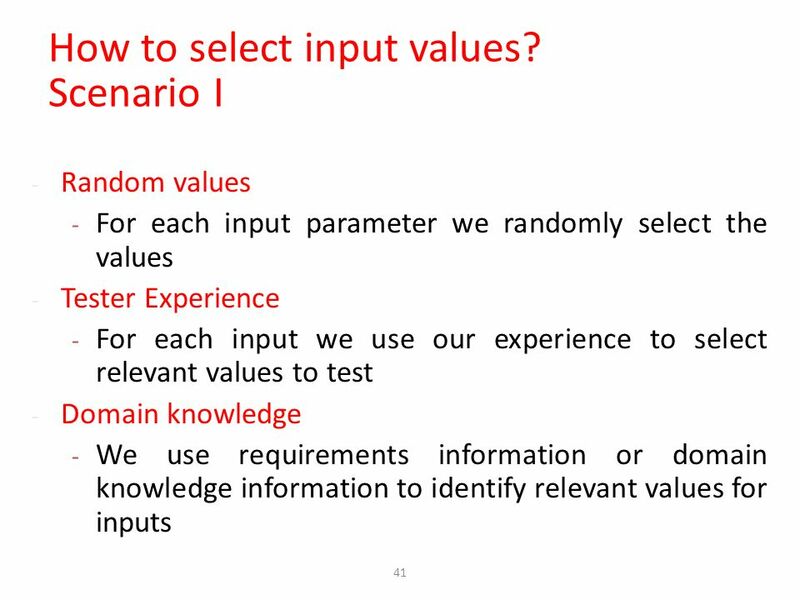 For example, validation of software for an airplane requires knowledge from aerospace engineers and pilots. 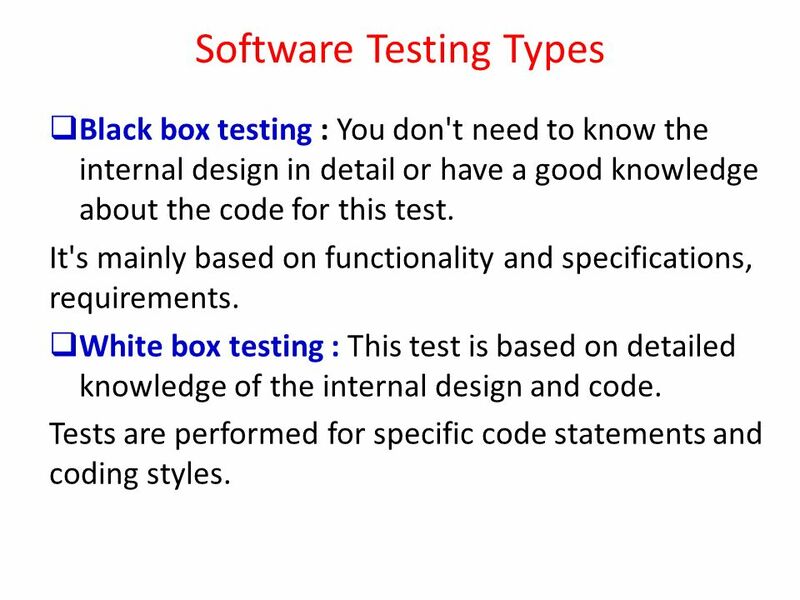 Black box testing : You don't need to know the internal design in detail or have a good knowledge about the code for this test. 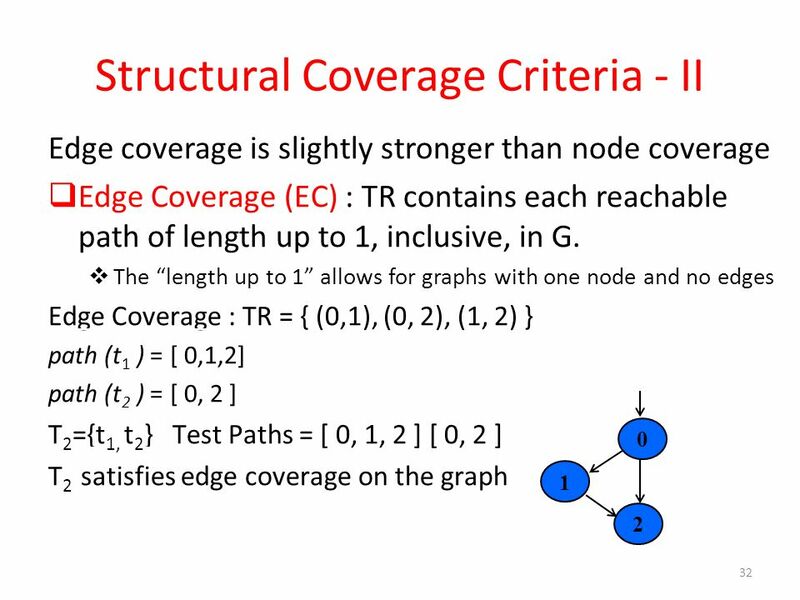 It's mainly based on functionality and specifications, requirements. 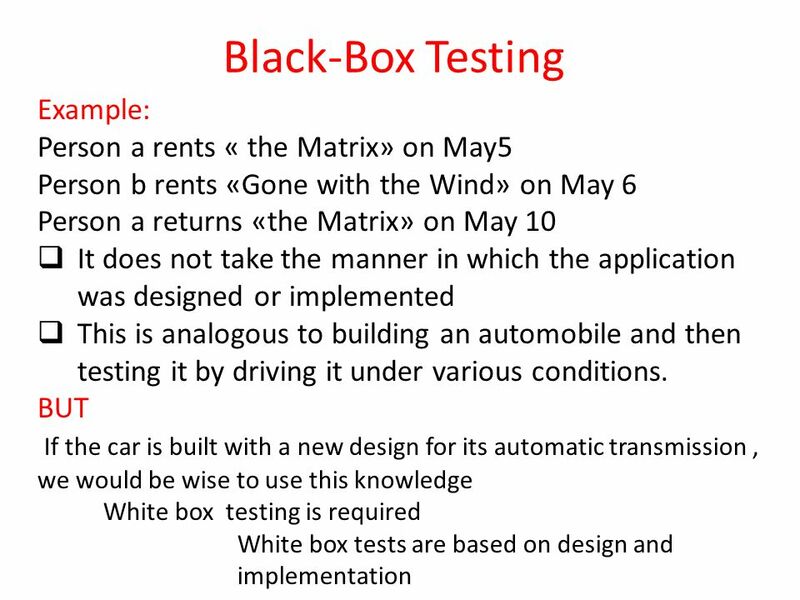 White box testing : This test is based on detailed knowledge of the internal design and code. 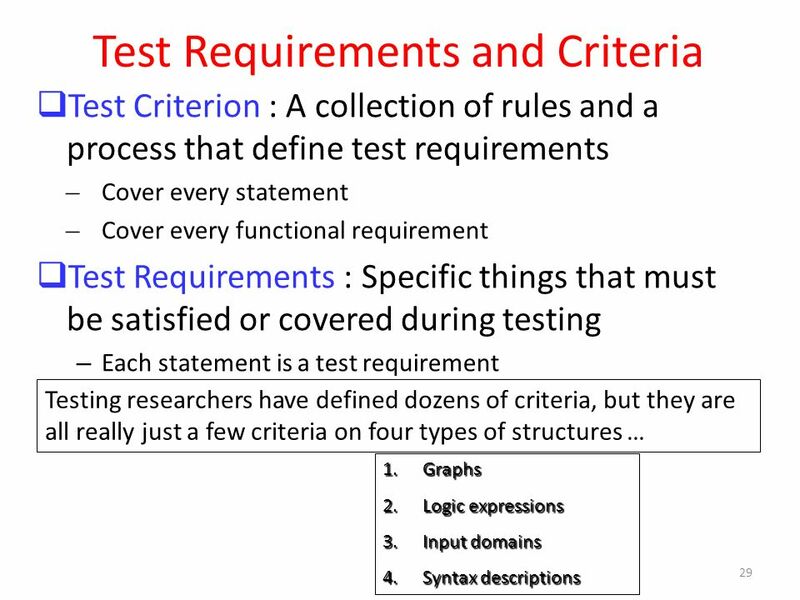 Tests are performed for specific code statements and coding styles. 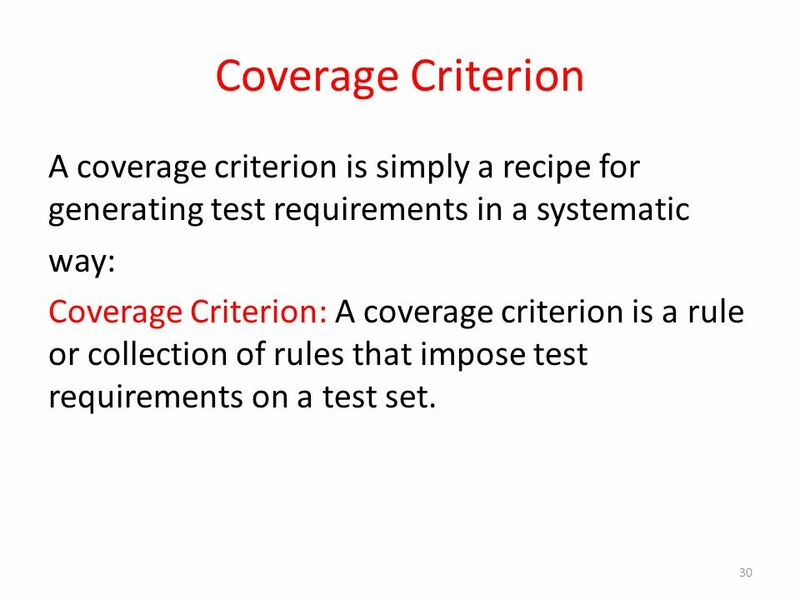 30 Coverage Criterion A coverage criterion is simply a recipe for generating test requirements in a systematic way: Coverage Criterion: A coverage criterion is a rule or collection of rules that impose test requirements on a test set. 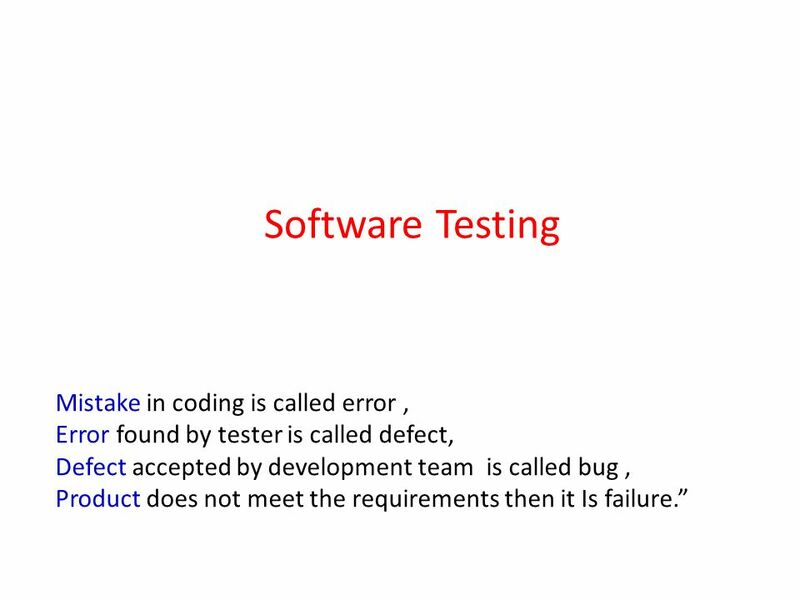 Download ppt "Software Testing Mistake in coding is called error ,"
SOFTWARE TESTING. 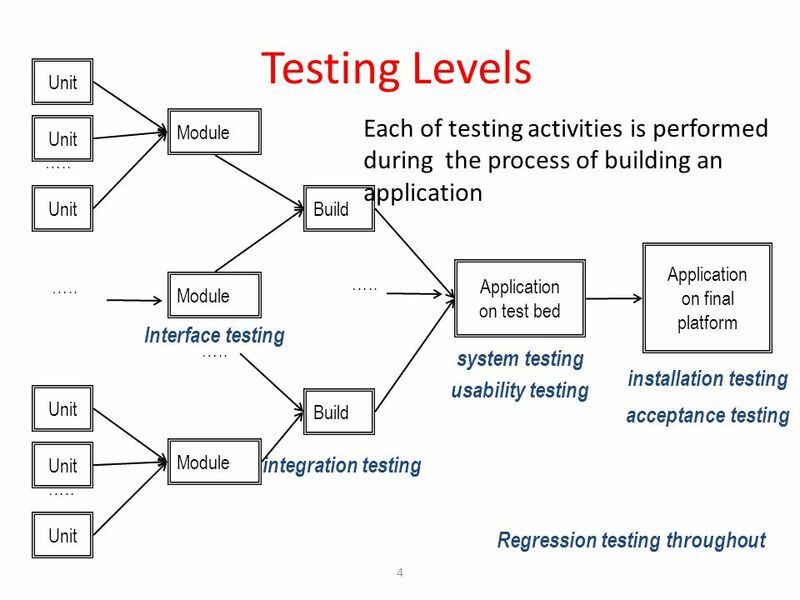 INTRODUCTION  Software Testing is the process of executing a program or system with the intent of finding errors.  It involves any. 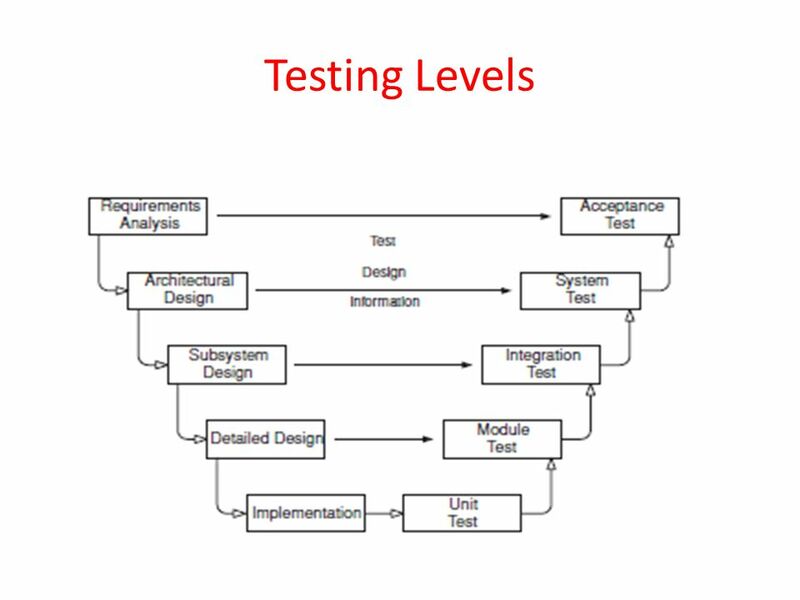 CITS5501 Software Testing and Quality Assurance Testing – Introduction Material from Introduction to Software Testing, ed 2, Ammann & Offutt. 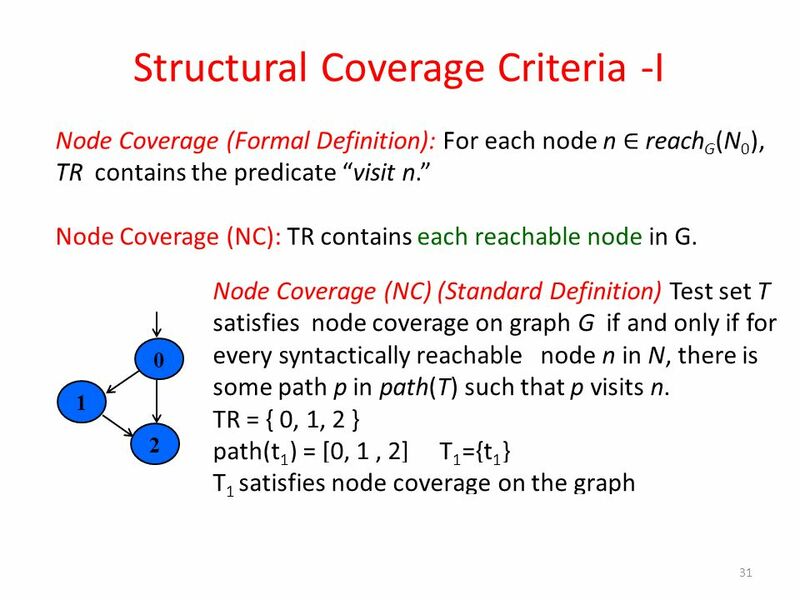 COVERAGE CRITERIA FOR TESTING 1. ill-defined terms in Testing  complete testing  exhaustive testing  full coverage Are poorly defined terms because. CMSC 345, Version 11/07 SD Vick from S. Mitchell Software Testing. 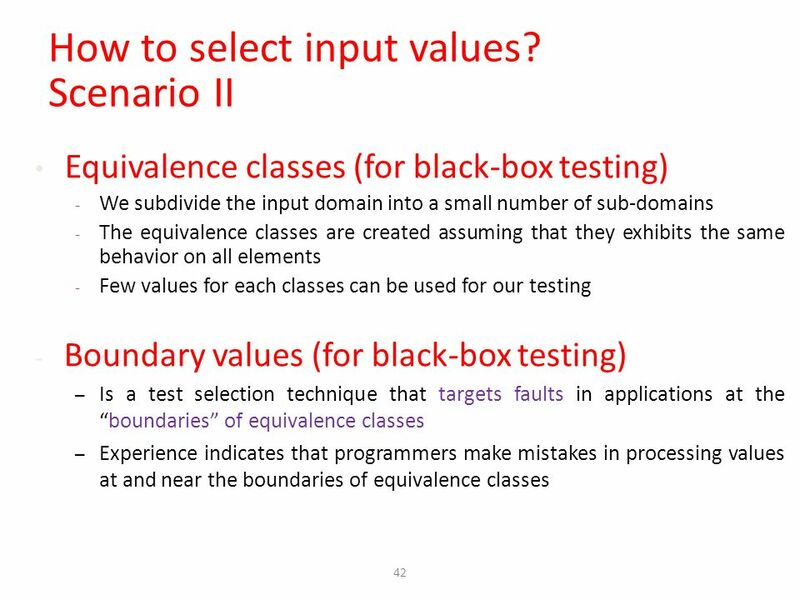 1 Software Testing and Quality Assurance Lecture 5 - Software Testing Techniques. 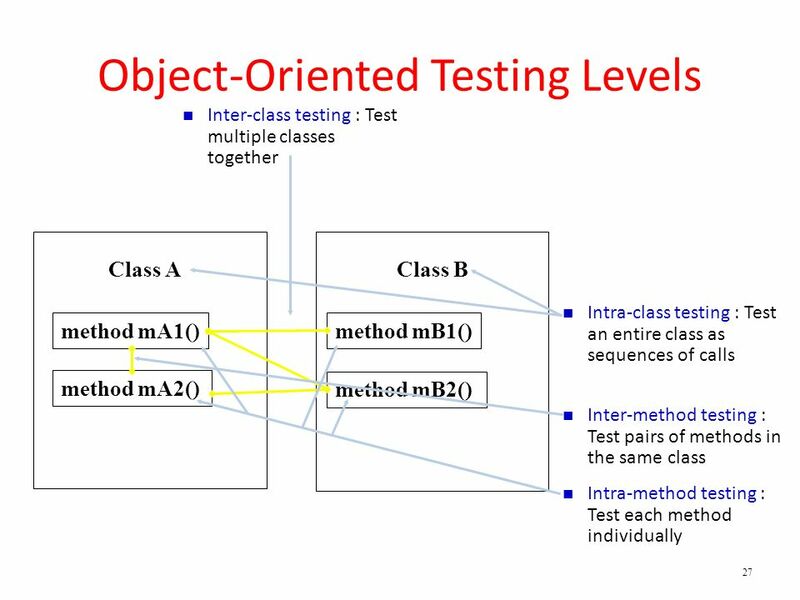 Chapter 11: Testing The dynamic verification of the behavior of a program on a finite set of test cases, suitable selected from the usually infinite execution. 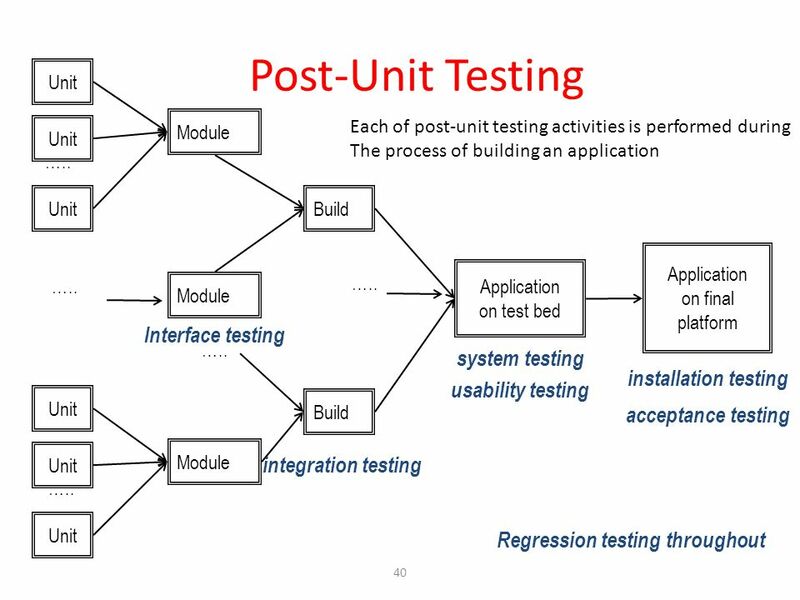 Software Testing Sudipto Ghosh CS 406 Fall 99 November 9, 1999. 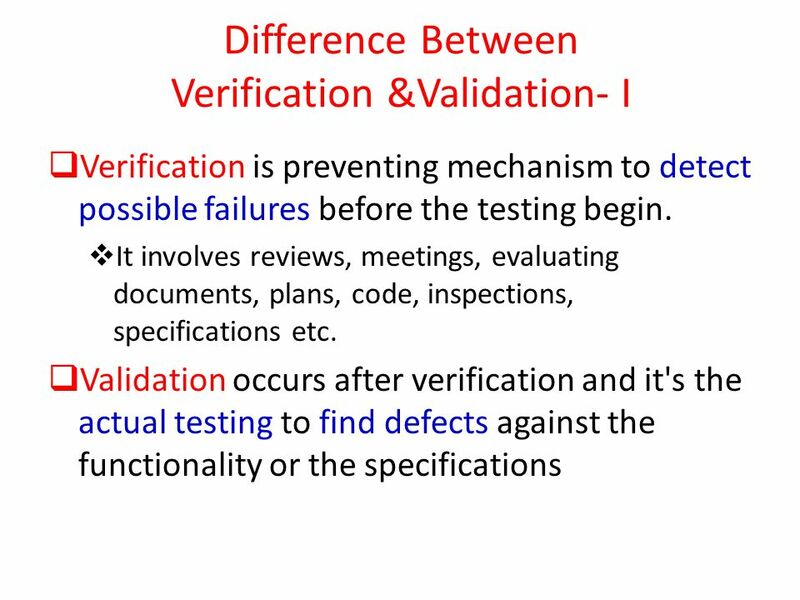 Software Testing Verification and validation planning Software inspections Software Inspection vs. 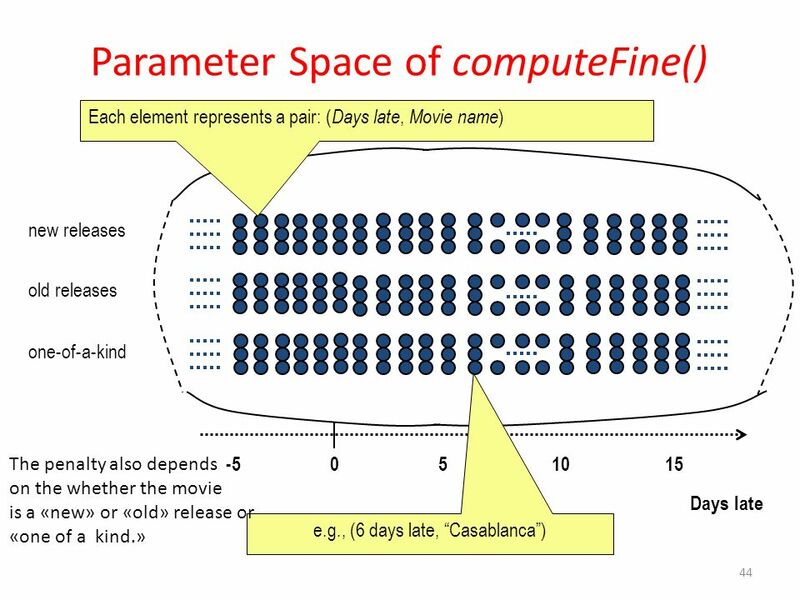 Testing Automated static analysis Cleanroom software. 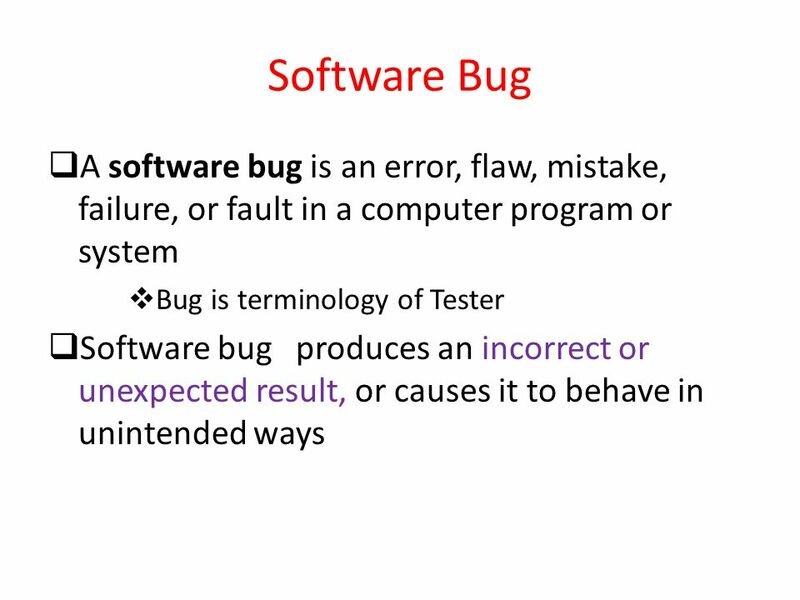 Software Quality Assurance & Testing Mistake in coding is called error, Error found by tester is called defect, Defect accepted by development team then.